Giorgione has always been considered one of the greatest artists of the Renaissance, and one whose influence on following generations of painters was considerable. For all his fame, very little is known about his short life (he may have died during a plague epidemic in 1510 at age 32 or 33), and only a few paintings can be definitively attributed to him. He initially studied with Giovanni Bellini, seems to have been influenced by Leonardo, and could claim Titian and Sebastiano del Piombo as his pupils. 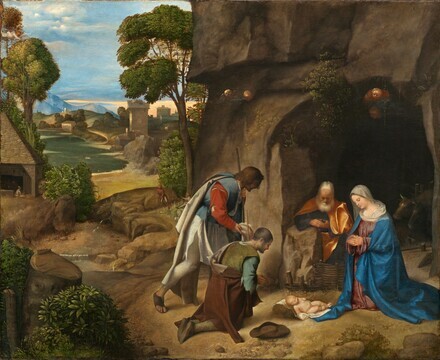 The Adoration of the Shepherds, or the Allendale Nativity, as it is commonly known after one of its previous owners, is now almost unanimously accepted as Giorgione’s work. This important painting had an immediate impact on Venetian artists. The composition is divided into two parts, with a dark cave on the right and a luminous Venetian landscape on the left. The shimmering draperies of Joseph and Mary are set off by the darkness behind them and contrast with the tattered dress of the shepherds. The scene is one of intense meditation; the rustic, yet dignified, shepherds are the first to recognize Christ's divinity and they kneel accordingly. Mary and Joseph also participate in the adoration, creating an atmosphere of intimacy. Cardinal Joseph Fesch [1763-1839], Rome; (his sale, Palazzo Ricci, Rome, 17 March 1845 and days following, no. 874). Claudius Tarral, Paris; (Tarral sale, Christie & Manson, London, 11 June 1847, no. 55); purchased by (Banting) for Thomas Wentworth Beaumont [d. 1848], Bretton Hall, Yorkshire, England; by inheritance to his son, Wentworth Blackett Beaumont, 1st baron Allendale [1829-1907], Bretton Hall; by inheritance to his son, Wentworth Canning Blackett Beaumont, 1st viscount and 2nd baron Allendale [1860-1923], Bretton Hall; by inheritance to his son, Wentworth Henry Canning Beaumont, 2nd viscount and 3rd baron Allendale [1890-1956], Bretton Hall; sold August 1937 to (Duveen Brothers, Inc., London, New York, and Paris); sold 1938 to the Samuel H. Kress Foundation, New York; gift 1939 to NGA. Provenance according to Kress records in NGA curatorial files. The painting is listed in the Duveen Brothers General Stock Book for the period 1 June 1937 to April 1941, and is annotated "Purchased Aug. 3, 1937" (copy in NGA curatorial files; Duveen Brothers Records, Accession No. 960015, Getty Research Institute, Los Angeles: reel 66, box 186). See also the letter of 4 March 1965 from Ellis Waterhouse to Fern Rusk Shapley, in NGA curatorial files. Letter, 21 June 1938, Duveen Brothers, Inc., to Samuel Kress (Duveen Brothers Records, Accession No. 960015, Getty Research Institute, Los Angeles: reel 329, box 474, folder 5; copy in NGA curatorial files). A Collection of Pictures of the Early Venetian School and Other Works of Art, Burlington Fine Arts Club, London, 1912, no. 19 (no. 58 and frontispiece in illustrated catalogue titled Early Venetian Pictures and Other Works of Art). Exhibition of Italian Art 1200-1900, Royal Academy of Arts, London, 1930, no. 395 (no. 332, pl. CXXV of commemorative catalogue published 1931; not in souvenir catalogue). Berenson and the Connoisseurship of Italian Painting, Natioanal Gallery of Art, Washington, D.C., 1979, no. 60, repro. The Pastoral Landscape: The Legacy of Venice, The National Gallery of Art, Washington, D.C., 1988-1989, no. 3, fig. 43. Bellini, Giorgione, Titian, and the Renaissance of Venetian Painting, National Gallery of Art, Washington, D.C.; Kunsthistorisches Museum, Vienna, 2006-2007, no. 17, repro., as Adoration of the Shepherds ("Allendale Nativity"), fig. 2 in brochure. Duveen Brothers. Duveen Pictures in Public Collections of America. New York, 1941: nos. 147-150, repros. Preliminary Catalogue of Paintings and Sculpture. National Gallery of Art, Washington, 1941: 78-79, no. 400, pl. V.
Book of Illustrations. National Gallery of Art, Washington, 1942: 247, repro. 113. Cairns, Huntington, and John Walker, eds. Masterpieces of Painting from the National Gallery of Art. New York, 1944: 64, color repro. Frankfurter, Alfred M. The Kress Collection in the National Gallery. New York, 1944: 47, repro. Paintings and Sculpture from the Kress Collection. National Gallery of Art, Washington, 1945 (reprinted 1947, 1949): 99, repro. Favorite Paintings from the National Gallery of Art Washington, D.C.. New York, 1946: 15-18, color repro. L. J. Roggeveen. "De National Gallery of Art te Washington." Phoenix 4, no. 12 (December 1949): , 337, repro. 335. Einstein, Lewis. Looking at Italian Pictures in the National Gallery of Art. Washington, 1951: 78-82, repro. Walker, John. National Gallery of Art, Washington. New York, 1956: 26, color repro. Paintings and Sculpture from the Samuel H. Kress Collection. National Gallery of Art, Washington, 1959: 154, repro. Shapley, Fern Rusk. Later Italian Painting in the National Gallery of Art. Washington, D.C., 1960 (Booklet Number Six in Ten Schools of Painting in the National Gallery of Art, Washington, D.C.): 24, color repro. The National Gallery of Art and Its Collections. Foreword by Perry B. Cott and notes by Otto Stelzer. National Gallery of Art, Washington (undated, 1960s): 19, color repro. 12. Walker, John, Guy Emerson, and Charles Seymour. Art Treasures for America: An Anthology of Paintings & Sculpture in the Samuel H. Kress Collection. London, 1961: 94, repro. 88, color repro. 86, 89. Walker, John. National Gallery of Art, Washington, D.C. New York, 1963 (reprinted 1964 in French, German, and Spanish): 142, repro. Summary Catalogue of European Paintings and Sculpture. National Gallery of Art, Washington, 1965: 58. Cairns, Huntington, and John Walker, eds. A Pageant of Painting from the National Gallery of Art. 2 vols. New York, 1966: 1:160, color repro. Schiller, Gertrud. Ikonographie der christlichen Kunst. 6 vols. Gütersloh, 1966-1990: 1:98, 218, 328, fig. 221. European Paintings and Sculpture, Illustrations. National Gallery of Art, Washington, 1968: 50, repro. Shapley, Fern Rusk. Paintings from the Samuel H. Kress Collection: Italian Schools, XV-XVI Century. London, 1968: 151-152, fig. 367-370. European Paintings: An Illustrated Summary Catalogue. National Gallery of Art, Washington, 1975: 152, repro. Gibbons, Felton. "Further Thoughts on the Allendale Nativity." Studies in the History of Art vol. 8 (1978):23-34, color repro. Shapley, Fern Rusk. Catalogue of the Italian Paintings. 2 vols. National Gallery of Art, Washington, 1979: I:208-211, II:pl. 144. Watson, Ross. The National Gallery of Art, Washington. New York, 1979: 35, pl. 17. Walker, John. National Gallery of Art, Washington. Rev. ed. New York, 1984: 196, no. 232, color repro. European Paintings: An Illustrated Catalogue. National Gallery of Art, Washington, 1985: 175, repro. Kopper, Philip. America's National Gallery of Art: A Gift to the Nation. New York, 1991: 180-181, 183, color repro. National Gallery of Art. National Gallery of Art, Washington. New York, 1992: 28, repro. Rearick, W. R. "From Arcady to the Barnyard." Studies in the History of Art 36 (1992):137-141. repro. no. 1. Rosand, David. "Pastoral Topoi: On the Construction of Meaning in Landscape." Studies in the History of Art 36 (1992):164, repro. no. 1. Freedberg, S. J. "The Attribution of the Allendale Nativity." Studies in the History of Art 45 (1993): 51-70, repro. no. 1, 3, 4, 5, 7, 14, 23. Steinberg, Arthur. "Blurred Boundaries, Opulent Nature, and Sensuous Flesh: Changing Technological Styles in Venetian Painting, 1480-1520." Studies in the History of Art 45 (1993): 216. Anderson, Jaynie. Giorgione: The Painter of "Poetic Brevity". New York, 1997: 294-295, repro. Freedman, Luba. The "Blurred" Horizon in Leonardo's Paintings, France, 1997, no. 1, repro. Gibson, Sarah S. “Shepherds/Shepherdesses." In Encyclopedia of Comparative Iconography: Themes Depicted in Works of Art. Edited by Helene E. Roberts. 2 vols. Chicago, 1998: 2:820, 823. Danziger, Elon. "The Cook Collection: Its Founder and Its Inheritors." The Burlington Magazine 146, no. 1216 (July 2004): 453. Hand, John Oliver. National Gallery of Art: Master Paintings from the Collection. Washington and New York, 2004: 90-91, no. 64, color repro. Santucci, Paola. Su Andrea Mantegna. Naples, 2004: 196, 431 pl. XCVI. Hartt, Frederick, and David G. Wilkins. History of Italian Renaissance Art: Painting, Sculpture, Architecture. 6th ed. Upper Saddle River, 2006: 600, color fig. 19.2. Bacchi, Andrea and Luciana Giacomelli, eds Rinascimento e passione per l'antico: Andrea Riccio e il suo tempo. Exh. cat. Castello di Buonconsiglio. Trento, 2008: 360. Villa, Giovanni Carlo Federico, ed. Cima da Conegliano: poeta del paesaggio. Exh. cat. Palazzo Sarcinelli, Conegliano. Venice, 2010: 58. Nardini, Claudio. Il natale--arte e letteratura. Florence, 2010: dust jacket cover, 117, 118-119, 256, color repros. Grassi, Marco. "Bernard Berenson Revisited." The New Criterion 32, no. 4 (December 2013): 11. Roberts, Roxanne and Amy Argetsinger. "Viscount Visits a Family Heirloom." Washington Post 136, no. 238 (July 31, 2013): C2, color fig. Brown, David Alan. "Looking Backward; Americans Collect Italian Renaissance Art." In A Market for Merchant Princes: Collecting Italian Renaissance Paintings in America ed. Inge Reist. (The Frick Collection Studies in the History of Art Collecting in America, 2) University Park, Pennsylvania, 2015: 2-3, 4, color fig. 2.